SUNDAY 7 DECEMBER, Vibe Live, 2-6pm, FREE: To celebrate the publication of the winter issue of Electric Sheep we’ll be screening a double bill of outrageous Icelandic horror movies, the comic book-style vampire comedy Frostbite (2006) and the classic 50s monster movie Terror in the Midnight Sun (1959). 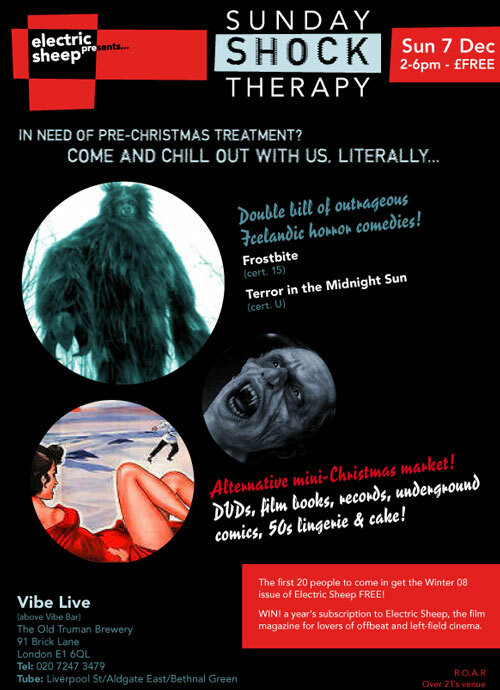 For all those desperate to find eccentric, bizarre, funny, enchanting, beautiful and non-mass-produced Christmas presents, we’ll also have an alternative mini-Christmas market with a film books and DVDs stall from Cinéphilia, London Underground Comics, Where It’s At Is Where You Are records, Sophistikitten retro lingerie, and cakes! The first 20 people in get a free copy of the new issue of Electric Sheep! You will also have the possibility of winning a year’s subscription to the magazine!